I must admit, I’ve never been one to get excited about sweet, fruity desserts—given a choice, I will always choose the decadent chocolate treat instead. However, I fell in love with the miniature berry cobblers delivered to our table after my mom’s birthday dinner in late August. They were beautiful treats of petite proportions; their crisp tops and warm berry filling were the perfect finish to a delicious meal at the Paseo Grill in Oklahoma City. Those desserts have been on my mind ever since. Hastened by the occasional breeze of crisp fall air, I set to make my own version of miniature blackberry and strawberry cobblers before the end of berry season. 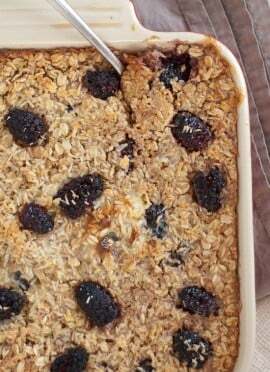 I used predominantly blackberries (they’re my favorite) and added some strawberries to ensure I had enough filling. 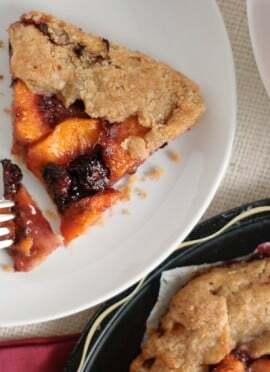 I searched around for a whole wheat version of cobbler crust for a healthier, heartier dessert and found one at 101 Cookbooks. Beautiful, right? I wish I had captured them in all their bubbly, hot-from-the-oven glory, but that would have required an assistant, a prettier surface to throw them on, and, uh, someone who knows what she’s doing. On the upside, they turned out nicely and tasted positively delicious. These miniature blackberry and strawberry cobblers have healthy, whole wheat crust and little added sugar. Perfect portions for individual dessert servings. Preheat oven to 375 degrees Fahrenheit. 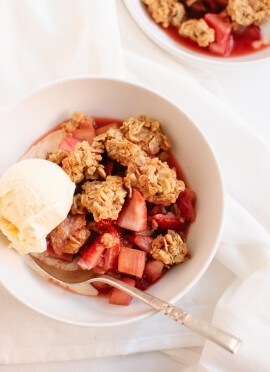 Chop the strawberries into large chunks. Gently mix the fruit, corn starch and sugar together in a bowl. In a larger bowl, mix the remaining dry ingredients together. Whisk the egg, buttermilk and butter together in a separate bowl, then pour into the bowl of dry ingredients. Stir the mixture until just blended. 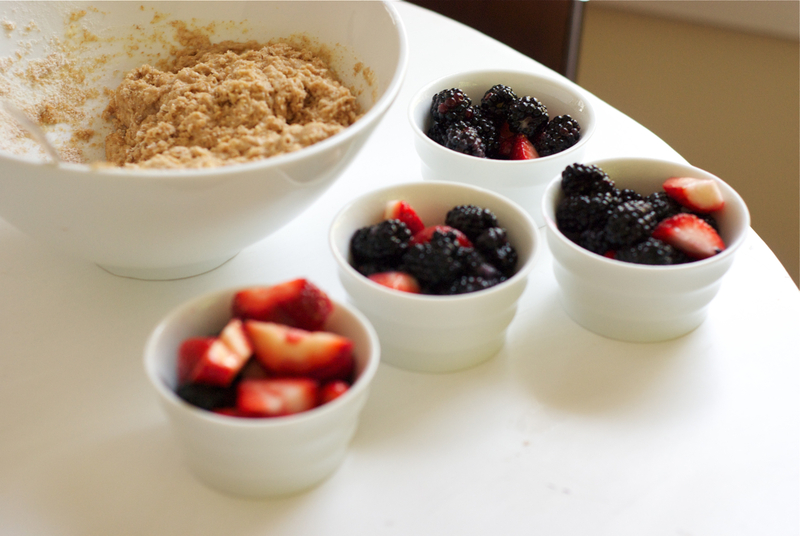 Spoon the fruit mixture into your ramekins and top with the dough. Bake for fifteen minutes or until the tops are golden brown. Crudely adapted from 101 Cookbook’s Cherry Cobbler Recipe. The little cobblers are so easy to make and would be the perfect conclusion to a dinner party or get together. Run on over to the store for fresh blackberries before it’s too late, and please let me know if you have suggestions for the recipe. I’m all ears! I feel exactly the same way about chocolate, but these little cobblers also get me going. 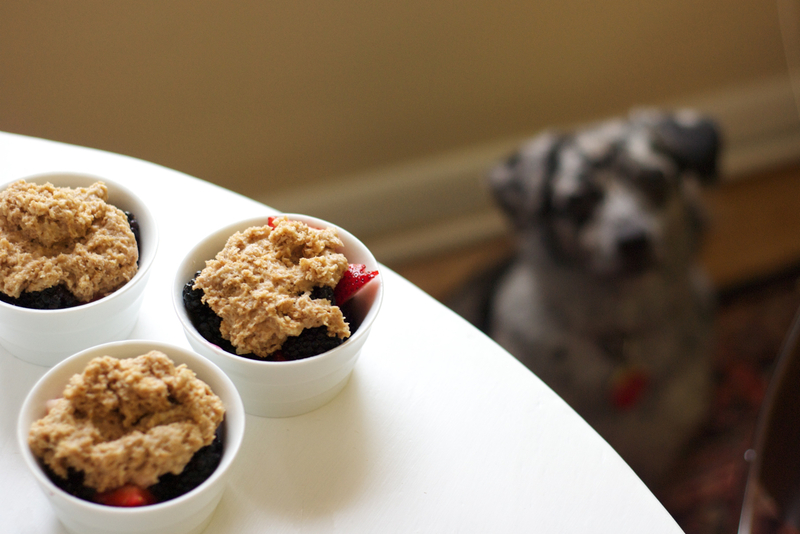 I love anything with blackberry, blueberry, or cherry – and what I love even more is how much easier cobbler is than pie! Seems like you do have an assistant. I see a very willing helper, ready to do any clean up duty or dish licking in the background of the third photo. I’m going to make these little yummies. Cookie is an excellent assistant… except for when I turn around to find her sneaking bites off my plate! Bad dog. She’s lucky she’s so cute. I’m sorry about that, Vicki. I honestly wrote this recipe before I knew much about writing proper recipes. I know what I was trying to say and updated the recipe with better measurements. 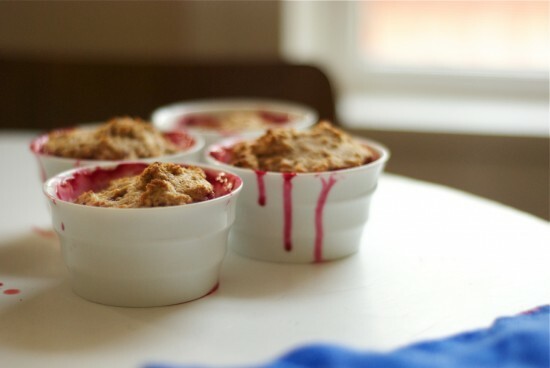 You could probably bake any cobbler/crisp recipe in little ramekins for around 15 minutes at 375 degrees, assuming that you have enough ramekins. I hate websites that automatically send you to the App Store to download some arbitrary app from one of your sponsors. I get that you need ad revenue but don’t have your site set to open an application. I am sure this post will not show up but here is some feedback. Because of these tactics I will not support your sponsors or this site and I will make sure the site is blacklisted with my ISP. Max, I am extremely upset to hear that an ad on my site did that to you. I’ve had that happen to me a couple of times. My ad manager tirelessly hunts down the source of those ads and shuts them down. I’m so sorry it happened to you. I do need ad revenue (I am self-employed, thanks to this blog and my loyal readers), but I promise that user experience is my top priority. Sometimes bad ads sneak past good networks’ monitoring systems. I’m forwarding your comment to my ad manager so we can stop this from happening to others and hope you’ll reconsider reporting my site to your ISP. What a bad tempered individual. He must have had a fight with his wife (if anybody would marry him) before writing this to you. Don’t be upset over this. I love your website. Your dog is much nicer than he is (and cuter too I am sure). How many mini cobblers does this make? Can you use Gluten free flour or any other flours instead of wheat? Hi Susan! I haven’t tried it with this one, but I think that would work. Let me know what you think if you try it!